Maria Ressa gets interviewed following her arrest. Screengrab from Facebook. 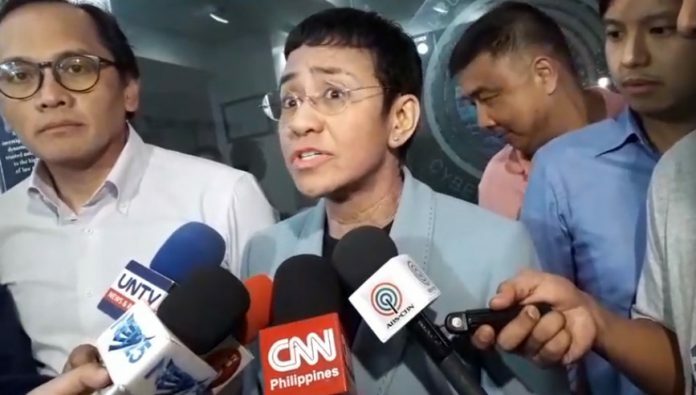 Philippine journalist Maria Ressa, CEO and executive editor of online media company Rappler, was arrested Wednesday night over cyber libel charges. Police officers wearing civilian clothes served a warrant of arrest against Ressa while inside the Rappler headquarters in Pasig City. The warrant of arrest was filed by Judge Rainelda Estacio Montesa of the Manila Regional Trial Court Branch 46 on the preceding day, February 12. The case involved an article published by Rappler entitled “CJ using SUVs of controversial businessman.” The business man referred to in the article was Wilfredo Keng, whose complaint served as basis for the Department of Justice to file the cyber libel case against Ressa. Keng said the article was defamatory. According to a Rappler article, the complaint did not stem from Keng’s ownership of the vehicle, but from the background story saying he has alleged activities involving illegal drugs and human trafficking. However, the cybercrime law in the Philippines was enacted four months after the story was published. Aside from that, Rappler contacted Keng and got his side before the said story was published. “I’m just shocked that the rule of law has been broken to a point that I can’t see it,” Ressa said in an interview. As of the moment of writing, Ressa and her lawyer Darwin Angeles said they will try to post bail as soon as possible. “We are not intimidated. No amount of legal cases, black propaganda, and lies can silence Filipino journalists who continue to hold the line. These legal acrobatics show how far the government will go to silence journalists, including the pettiness of forcing me to spend the night in jail,” Ressa continued. Meanwhile, Rappler published a statement following Ressa’s arrest. “If this is another of several attempts to intimidate us, it will not succeed, as past attempts have shown. Maria Ressa and Rappler will continue to do our jobs as journalists. We will continue to tell the truth and report what we see and hear. We are first and foremost journalists, we are truthtellers,” it said. Aside cyber libel, Ressa also faces tax evasion charges and violation of the anti-dummy law. On the other hand, various advocacy groups and personalities have declared the arrest as an attack on press freedom. “It is clear that the Department of Justice perverted the law by charging Maria for an offense allegedly committed before it actually became an offense under the law,” NUJP said. “This government, led by a man who has proven averse to criticism and dissent, now proves it will go to ridiculous lengths to forcibly silence a critical media and stifle free expression and thought,” it continued. The group Let’s Organize for Democracy and Integrity (LODI), a community of artists and media practitioners in the Philippines, has likewise issued a statement in their Facebook page. “Nobody believes for a single moment the concocted charges of tax evasion and foreign ownership. The truth is, the onion-skinned tyrant Duterte simply wants to shut down and punish both Maria and Rappler,” it said. “In a country where justice takes years to obtain, we see the charges against her being railroaded and the law being used to relentlessly intimidate and harass journalists for doing their jobs as truth-tellers,” the group said in a statement. “This much is certain: Rappler’s coverage of Duterte’s drug war, together with other media outfits, has unmasked the Duterte regime for what it truly is—a full blown dictatorship—and made its intentions quite plain: To intimidate the people and the press from getting too meddlesome,” he continued.